64. Missing Underwear or VERY personal items. Curses are one of the most common practices since the dawn of human civilization. Unfortunately, this magical activity still is an extremely popular Witching ritual in many parts of the World. This is why is very common to be cursed. In order to defend ourselves, we must first know what we are dealing with. A Curse or a Hex is a form of the spell, cast either spontaneously (driven by anger or other dark emotions) or strategically (using ritual magic) with exceptionally malevolent and ill intention. The Word Hex comes from the German language – Hexe – and it actually means a Witch. 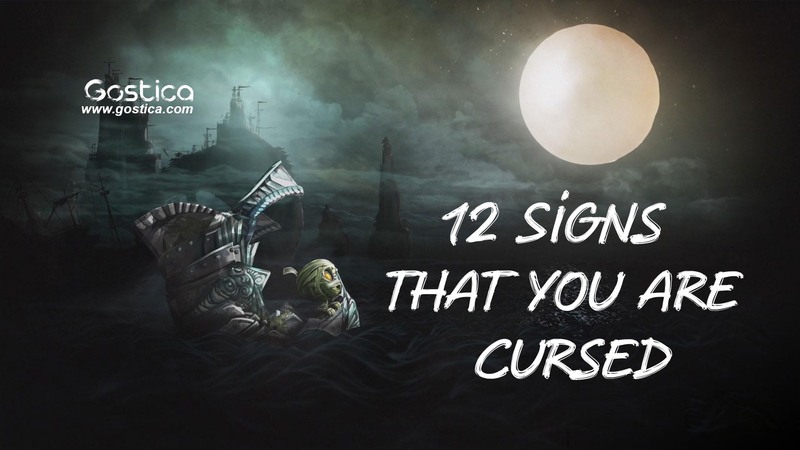 A curse can target a person, a location or even an object. Once the Curse is cast it will try to mark and harm the target by any means possible. Whether the Curse will succeed depends on how protected the target currently is. The Curse can endure years and they can endure even Death, thus follow the target for his/her next incarnations. You Probably need to Think of it in another way. Will the Wars ever stop while humans still invest in creating and inventing new weapons? The same applies to curses.The Karmic burden of this material plane is getting heavier as we still insist on cursing instead of liberating and healing ourselves. Cursing is an active attempt to ‘bend’ someone else’s Free Will. This violation of the highest spiritual Law brings an instant lowering of our spiritual vibrations. “An it harms none, do what ye will”. Please remember that we are all connected. We are all part of the same energy matrix. The more we ‘blacken’ it, the worse will the consequences be for all. Witches who target you need to establish contact in order to effectively curse you. To do so, they have to employ several ways. The most usual tool of Dark Witches is Fear. Fear links people. If you feel cursed then this is likely to occur like a self-fulfilling prophecy. Psychologically speaking, when we are convinced we are targeted, we may act like cursed people. Has someone broken into your house? Regardless the ‘curse’, Call the Police if you believe that someone broke into your house and left something that spooky to terrorize you. Any possible ‘breaking and entering’ as well as an act of vandalism should be reported. Call the local ‘Ghost-busters’ aka the Witches or Exorcists who professional deal with stuff like this. Get rid of the spooky artifact. Never throw a possible cursed artifact in a lake! In a similar way, witches may need to ‘mark’ your territory with a sigil or a demonic talisman. Finding ‘magical’ talismans or sigils of unknown origin on your territory means a Witch or someone who impersonates ‘a witch’ was there. This sigil is possibly inscribed by a knife (ritual dagger) or a paint with a magical ink. Is this a Vandalism?Regardless the ‘curse’, Call the Police if you feel that you should report a vandalism which took place in your territory as it may mean that someone, may try to terrorize you. Any possible ‘breaking and entering’ as well as an act of vandalism should be reported. Get rid of the spooky symbols – remover it. Throw Holy Water on the spot AFTER you cleanse it. Photos (especially the older or non-digital ones) are believed to possess something from your Auric energy on them. They can actually act as a link to the photographed person or animal or place. It is used as a focal point for many rituals, both good and evil. Hence, missing photos from your room or house mean that someone may steal them to use them for dark rituals. Has someone broken into your house? Regardless the ‘curse’, Call the Police if you believe that someone broke into your house. Any possible ‘breaking and entering’ as well as an act of vandalism should be reported. Of course, just a missing photo would be hard to explain. So don’t exaggerate. 4. Missing Underwear or VERY personal items. Underwear or clothes (especially worn) have a strong Auric Imprint drenched in them. The same applies to your very personal items (for example your watch). This thick energy of yours can be used as a link in rituals both for good or ill purposes. Regardless the ‘curse’, Call the Police if you feel that someone broke into your house. Any possible ‘breaking and entering’ as well as an act of vandalism should be reported. You man not want to report some missing underwear, but what about the expensive personal items like a Watch or Jewelry. Sometime a Witch might use enchanted potions to hex you or your territory. To do so, the liquid has to be spilled around or in your house or on your doorstep. To find such liquids along with iron nails or scattered glasses might mean that someone is trying to curse you. If you don’t know the origin of the liquid, call a professional team to cleanse your territory from this substance. Throw Holy Water on the spot AFTER you cleanse it. Sometimes, a psychic attack – aka a curse – interacts with your energy matrix which you may probably feel like pain. Hence, this pain is actually a warning from your Aura that something bad has happened. Especially if this pain is nothing like you’ve ever felt or affects a part of your body which is 100% healthy. Call your Medical doctor. Any pain should first be examined by a medical professional. Monitor the pain. When did it begin? Was it on a waning moon? On the night of a Full Moon? Keep a log. Cleanse and Shield your Aura. If healthy houseplants get sick without any reason, first you have to check the soil. Usually, ‘undercover’ evil witches prefer to bury enchanted items on houseplants. The houseplants get easily sick because they don’t have an effective way to cleanse their aura. They are the first to get affected. Peach trees which bloom early are also believed to be a dark omen. Examine the soil and the pot. If a mystical or unidentified item or liquid is found get ready for cleansing. Get rid of the item. Consult a professional if more of your plants are affected. Birds – usually raven – flying around your house or territory. Cats assuming a defensive pose. Ants (especially red ones) occupying a place (where they were not before). Observe closely the animal behavior. Try casting a cleansing spell or rinsing your home with Holy Water. Do the animals behave differently now? Usually, witches who curse are enraged people who are prone to making mistakes. Therefore, they don’t cover their ‘psychic tracks’. Hence, an intuitive yet cursed target might persistently see the target in his/her dreams. This might be a warning signal. Ask yourself: Is there a reason why this person is cursing me? If you think that you may have done something bad to this person, try to make things right. Make a ‘forgiving ritual’. This is the ultimate way to break the connection. 1. Forgive yourself for letting your guard down or for any mistake you believe you made. 2. Forgive the one who you believe has cursed you or for any mistake. Spotting a blue butterfly is an omen that Magic is at work here. Unless the magic is yours, bear in mind that you may need to read between the lines. Crows and Owls are also attracted by magic, both good or evil. If an owl is hooting before dawn or raven accidentally crosses your path try to see what is going on. Deathwatch Beetles making weird noises. It is believed to be an ill omen as this sound is more commonly observed around dead or dying people. Finding a dark egg yolk is considered to be a dark omen of black magic. It is also a way to find out if you are cursed. See here on the Way to scry for curses with an egg. Observe the Omens patiently. Write it down. Ask help for what you’ve seen. Prophetic dreams might be very helpful. If the omen persists cast a cleansing Ritual and Conjure a Shield. Will-o-Wisps are commonly believed to be ill omens of Dark Magic or even Death. They are also known as ‘corpse candles’ or ‘ignis fatuus’. A will-o’-whisp is an atmospheric ghostly yellow, greenish or pale white orb which seems to follow someone. In Mexico, it is believed that the brujas aka witches, actually transformed themselves into flickering balls of light to follow their targets. An actual ‘Will-o’-whisp’ and a Japanese depiction of an evil ‘will-o’whisp’. The last is my ‘favorite’. Amulets are worn so that they take all the damage instead of the person or house they are protecting. Hence, when an amulet is broken or disappears it means that its energy has been consumed. Replace the Amulet with a New One! DO NOT FIX THE BROKEN ONE. Return the broken amulet to the Earth and thank the spirits for helping you. Do You Believe Someone Cursed You?